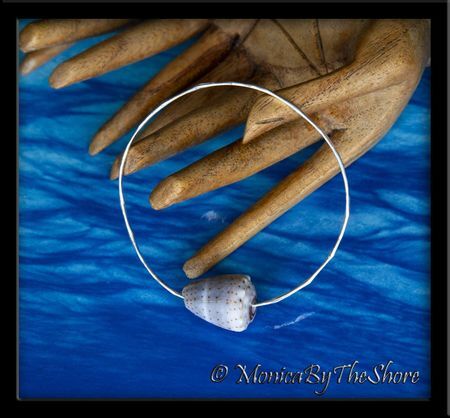 A large Abbreviated "Money" Cone Shell from Ke Iki Beach on the North Shore dangles from a shiny Scallop textured sterling silver bangle bracelet! This beautiful Cone Shell slides along the wavy texture of the bangle bracelet that catches the sunlight and sparkles with Aloha! Wear one or a stack a few and have Fun and Enjoy! This bracelet sized at 8 1/2 inches circumference and is 14 gauge sterling silver wire. 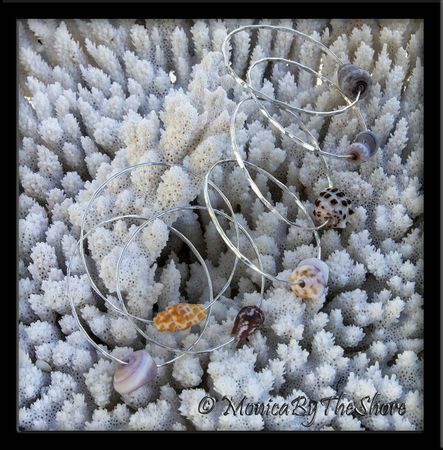 Original, hand crafted, one of a kind MonicaByTheShore Sunrise Shell and Seashell jewelry, made with Aloha on Oahu's beautiful North Shore, Haleiwa and Honolulu Hawaii.